Dokuro (which means "skull" in Japanese) is a cute fantasy puzzle platformer game for the Playstation Vita. 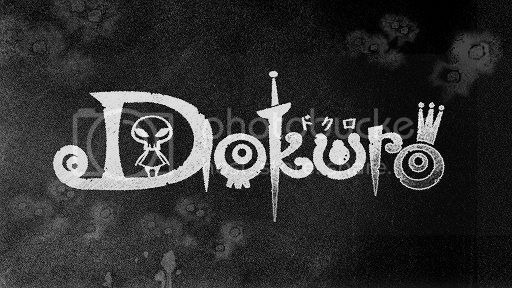 Developed by the same house which gave us the Lunar series, the Grandia series, Ragnarok Odyssey, among many others, Dokuro is a departure from Game Arts' usual offerings. This review is for the Japanese physical release. 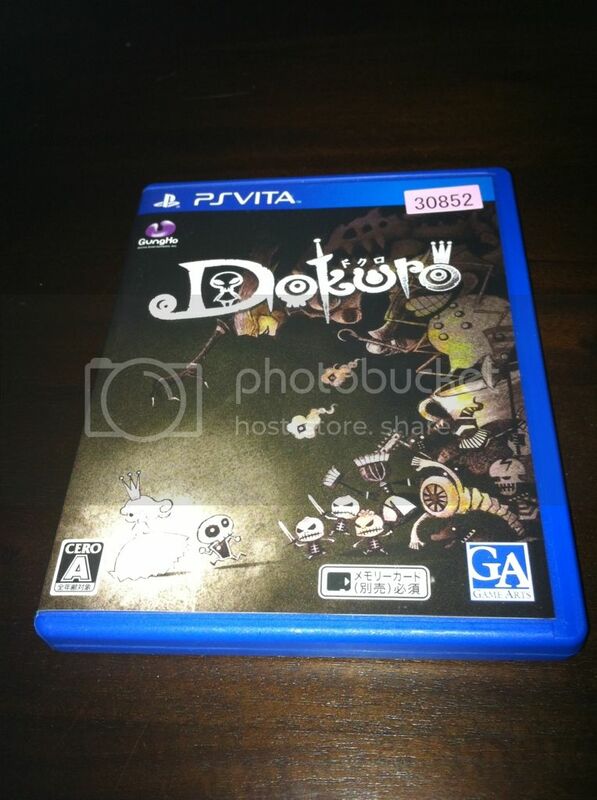 Dokuro is planned to be released in other regions as well, but only in digital form via the PlayStation Network Store. The game starts off by introducing Dokuro as a very lowly servant to a demon-type character who is called the Dark Lord. The Dark Lord has captured a princess and imprisoned her (with plans for marriage) in a holding cell located high in the Dark Castle. Dokuro, who seems to be in charge of guarding the princess, falls in love with her at first sight . Little Dokuro has a slight dilemma: free the beautiful princess, or be loyal to the Dark Lord. Like any man would, he chooses the princess and frees her from her cell. Upon being freed, the princess does not thank Dokuro or even acknowledge his kindness. He should have thrown her back in her cell...I would have! Anyway, the path out of the dark castle is riddled with traps, puzzles, obstacles, among other things, and the princess is completely helpless. Lucky for her Dokuro is a sucker for a beauty in need, unlucky for Dokuro she will never appreciate his efforts in assisting her with her escape. You can't help but feel sorry for poor little Dokuro who tries his best to help the princess. Any skeleton with a backbone would have left this cold, shallow, ungrateful princess where he found her, but little Dokuro tries his best to please a woman who may never notice or care about him. Dokuro has basic controls. Jump, attack, and an 'action' button which pushes and pulls objects. In the first cutscene we are shown a special potion which turns whoever drinks it into a warrior. Dokuro gets a hold of this potion early on in the game and with it he can transform into a handsome prince with a sword which the princess does notice. 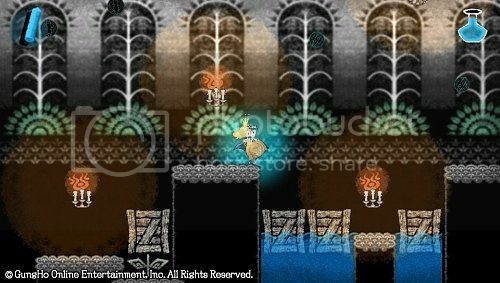 Players are to use Dokuro's true form to jump to hard-to-reach places as he can jump higher and is more nimble. 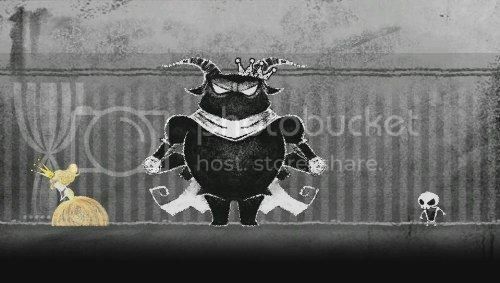 Dokuro's prince form is strong so it is best used for attacking enemies and carrying the princess over obstacles. Unfortunately for Dokuro he can only remain in prince form for about 20 seconds at a time. When he transforms back into the lowly skeleton the princess pays less attention to him. With the default control settings you must use the front touchscreen and rear touchpanel to change shape, which can be bothersome for those, like myself, who don't like touch controls. Touch controls cannot be completely avoided. During the course of the game, you obtain different colored pieces of chalk each serving a specific purpose. The white chalk acts as a rope, the red chalk acts as a dynamite fuse, and the blue chalk creates pools of water. Your fingers acts as the chalk as you draw your way out of certain obstacles. I don't think it's too intrusive to the gameplay and although I don't really like taking my hands off of the controls, the chalk aspect of the game fits nicely. The game's 16 stages are comprised of different areas of the entire castle. Each area has a theme; from a banquet hall to a garden, from a kitchen to an elevator shaft. 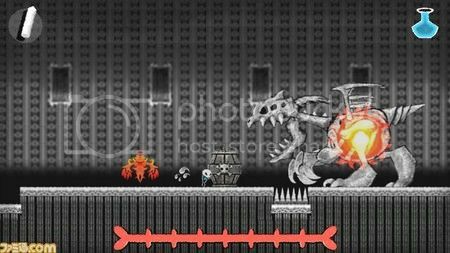 Each stage is broken up into 10 different puzzles, or 9 puzzles with a boss fight. Each puzzle is timed so that players can measure their performance and improve upon it accordingly. There is no time limit, so you can take as long as you like, but one of the challenges of the game is to finish as quickly as possible. Other than solving the puzzle of each section, there are also platforming elements such as pitfalls and enemies which must be defeated in order to complete the puzzle. 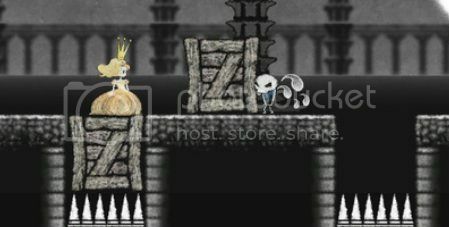 Each section contains a gold coin which seems thrown in just to give Dokuro an additional objective aside from assisting the princess. In the overworld map you can choose to retry older stages if you want to better your time or collect a gold coin you may have missed. The end of each section is marked by a radiant flower which the princess is highly fond of. Dokuro has just risked life and limb to protect her and all she cares for is a flower. Every other stage or so does have a boss fight and this is another area where the game shines. The boss fights are fun and are challenging, but not to a point where the fight becomes a chore. For the veteran gamers, they may seem a bit easy. I thought they were just right. Classic game strategy, memorize their patterns then attack accordingly. The game's art direction is something out of a Tim Burton film. Everything looks so crisp and beautiful on the Vita's OLED screen. The music blends well with the atmosphere which, but some may not like the music's 'French' sound. The game does not have many vibrant colors as mostly everything is dark and monochrome with some color here and there. When Dokuro transforms into the hero, the backgrounds light up with color and so does Dokuro himself. I think this is a great effect. Dokuro is only noticeable when he is attractive. Art imitating life! The game is very well-designed and quite lengthy so it will keep you busy for hours. I think 10 to 12 stages would have been enough, but at 16 stages you're getting a lot of bang for your buck. Some stages will frustrate you, others will be a breeze. They're all mixed up so you never know what you're getting next. Also, the game is very accessible. People who like to play games imported from Japan are often faced with the same dilemma: not understanding Japanese. Fret not, this game can be played in English. It doesn't stop there. The language options, other than Japanese and English, include French, German, Italian, Korean, and Spanish. The boss fights are very fun and creatively designed. The game is beautiful to look at and fun to play. Nothing I can really say here that I haven't mentioned already. This is a fun game and perfect for a portable system as it is fully enjoyable even in short bursts. The touch control motion needed to transform was a clumsy add-on. As mentioned previously, it can be redirected to the "R" button which is where it should have been in the first place. The game could have used more audio tracks as the music is recycled throughout the game. The music isn't annoying, but I think given the length of the game, the developers could have taken the opportunity to create some really great atmospheric music to go with Dokuro's gothic/whimsical theme. Some might say this game is just a two-dimensional ICO. While that does hold some truth to it, it is barely a rip-off. It is unique in its own right. This game is profound, funny, cute, challenging, and addictive. Trying to best your own clear times creates great replay value. I highly recommend it to any fan of the platforming and puzzle genres. Dokuro is a whimsical, tragic story about a boy stuck in the bowels of unrequited love who would do anything to win over the woman who would never give him the time of day. Maybe. If you like the art and music, here are free downloads from the publisher.